Dental implants in Ann Arbor are the best way to replace missing teeth. That’s because they’re sturdy, natural-looking, and have the power to prevent bone loss. They can even last for a whole lifetime! Unfortunately, many people decide not to get implants because of the cost; they have a significantly higher upfront price than some alternative choices. But before you settle for less than the best, consider these tips for getting implants in a manner that won’t break the bank. Not all dentists charge the same prices. Search for practices in your area that are able to perform the procedure and compare overall costs. You might be surprised by the differences in price between different dental care providers. But here’s a warning: Don’t compromise quality for cost. Be sure to examine each dentist’s credentials and choose someone who has extensive experience with implants. Dr. Olsen, for example, is a skilled oral surgeon who has been performing the procedure for many years. Most dental insurance policies do not cover implants. However, that doesn’t mean it’s not worth checking. Companies are always making adjustments to what they will and will not cover, and some, because of the proven health benefits of implants, are starting to change their ways. It’s unlikely that they’ll cover the entire procedure, but they may help you pay for at least a portion of it. You might also take a moment to examine your medical insurance. It might not cover your new teeth, but it’s possible that it will help pay for bone grafting if you need that before you’re able to receive the implants. Many dentists accept dental discount plans. These plans may provide you with a percentage off any dental procedure, including implants. Even if the discount is only 10 to 15 percent off, that still represents a significant savings when it comes to something as big as getting your teeth replaced. Be aware that some discount plans have a waiting period before you can have any major work done, so be sure to look at all the fine print before you commit to anything. Fortunately, you don’t have to pay for the entire cost of your implants upfront. Many dentists accept major credit cards. An even better option, though, is CareCredit, which provides low-interest or no-interest financing for dental procedures as long as you keep up with your payments. You can apply for this option at your dentist’s office. 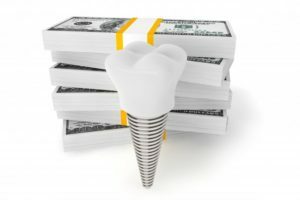 Getting dental implants is a significant investment, but the procedure presents a long-term value that other tooth replacement options lack. Using the above tips can help you get your smile back without wrecking your budget. Dr. James Olsen is your dentist in Ann Arbor. He loves to help his patients reclaim their smiles and enjoy all of the benefits of dental implants. If you’re thinking about replacing your missing teeth, please contact our office at 734-996-0200.